Designed with the serious small boat offshore fisherman in mind. Safety strap keeps your rod from bouncing out of its rod holder while you are en route to the fishing grounds. Available in black or white, four per package. 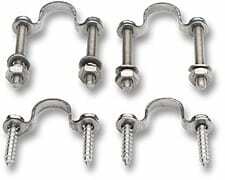 All stainless steel hardware available in through bolt or self tapping. There is 30 feet of soft monel on our handy pocket pack dispenser. 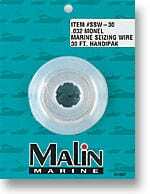 This wire is perfect for seizing shackles, and can be used on anchors, turnbuckles, or any place you need the security of locking a fastener in place.